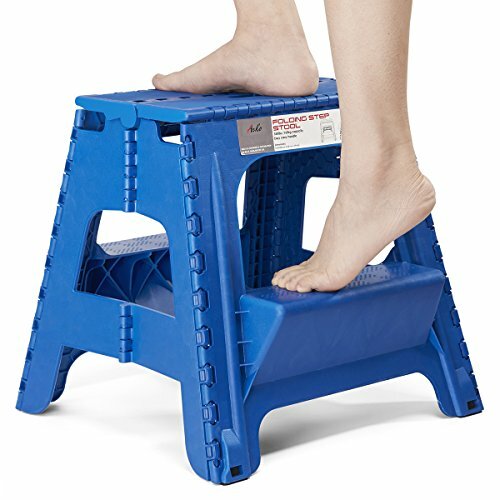 HIGH COST-EFFECTIVENESS & FOLDING FUNCTION:The two-in-one design, make this step stool costs less money and have higher cost-effectiveness than a step ladder and other conventional step stool. Much more than this, it's folding function can save your household space. EASY TO USE : Made of high quality plastic,be stable enough and durable enough . this kind of step stool has two side pedal, perfect for you to stand on the stool step by step,super safe and sturdy construction.Designed fold easily and quickly, Just pull up the handle and push in the sides, the Acko folding stool is great for use indoors and outdoors, kitchen bathroom or the garden. SQUASH and ROUND CORNER PROTECTION FEATURE - Acko have designed a safety stop gap feature that allows the foldable stool to prevent being squashed, great for kids. Four round corner super safe protect your body from clashing. All of this design is put your kids safe first! ANTI SLIP: Special texture on the surface and anti slip surface on the feets help stabilise and prevent slipping, especially around the kitchen bar, bathroom areas. PROPER USE - The maximum load capacity of the folding step is 350 pounds, which is mainly used for children and adults indoor sitting. when we need to stand on it and reach up a high place, folding stools can carry a safe weight of 150 pounds. Standing on the stool must keep both feet on the middle of the stool, so that the stool can be balanced by force. The step stool must be used in dry and flat surface. Mustn't place the product in the environment above 30℃ and below﹣5℃ more than 5 hours.